That first top is absolutely fabulous! I think you need to put the skirts in the storage box. My cousin had problems with it too! I think you're right! So sad to have to say goodbye to so many skirts for a while! 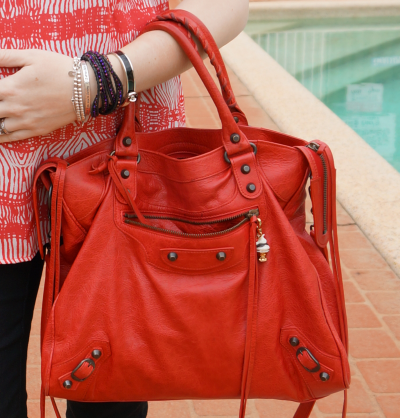 Love the orange/red bag! Sorry...no tips, but you've been doing a fabulous job of dressing the little one! I do love your red printed top - and I suppose that is a big problem with most skirts. But I'm sure there are plenty of dresses in your closet you can still wear without problem! I love both of your Balenciaga bags!!! Too chic! I love the doggy in your outfit photos, I try to get my dogs in as much as I can. But right now it's so cold out I've been leaving them out of a lot. hehe, yes sometimes in winter Cooper doesn't like to come out for photos as it's too cold for him! You look so cute! I love the first outfit, the orange is really pretty on you. All of your Balenciagas are to die for! Gorgeous collection..
love the first top a lot! Looks like a balenciaga filled days so far :) love your cute oregano summer outfit style! The red loose top your mum got you is so adorable! And I seem to have a thing for Balenciagas lately! hehe! Both look soooo good on you! I love the crochet lace detail in the top. It's so pretty Mica. Yes, maxi skirts are great for this. You'll get a lot of wear out of them. I'm having to stop myself from buying more maxi skirts...haha! You look amazing and girllllllllllllllll I want your bag! I'm trying to avoid buying too many maternity clothes for as long as possible - will see how that goes, as I'm already feeling the pinch of not having 'enough' skirts! those jeans look so good on you and i love how it looks paired with the colorful top! Such a pretty outfit! you look really beautiful in these photographs! Always so bittersweet when we have to retire old favourites due to overwear! 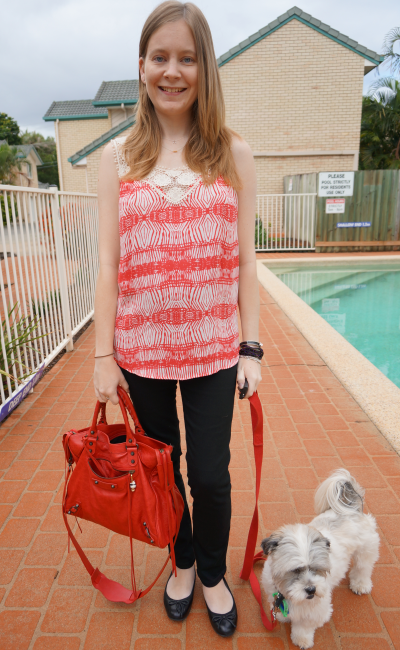 I just love that bright top! The print and color are so gorgeous on you! I love that red top. The print looks so fun and cute! I'd like to say AGAIN that I love your bags, the red top is lovely also. such a pretty outfit - love the bag! Another cute outfit. Love the pop of red. Hope you're having a great week Mica! I am loving the pop of red in that first outfit! Definitely perfect for the occasion, and just a fun bag. You look so pretty dear, I miss being pregnant! Maxi dresses and skirts are best while pregnant. While I was pregnant I wore a lot of my Pencil Skirts over the baby bump, left the zipper undone in the back and wore longer tops with them. They weren't too short for work. Oh I couldn't wear any of my skirts with the zipper undone, they wouldn't stay up!